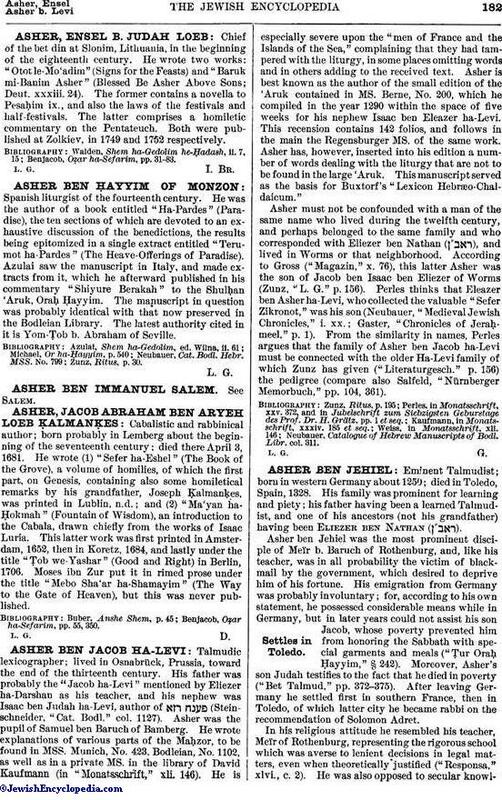 Cabalistic and rabbinical author; born probably in Lemberg about the beginning of the seventeenth century; died there April 3, 1681. He wrote (1) "Sefer ha-Eshel" (The Book of the Grove), a volume of homilies, of which the first part, on Genesis, containing also some homiletical remarks by his grandfather, Joseph Ḳalmanḳes, was printed in Lublin, n.d.; and (2) "Ma'yan ha-Ḥokmah" (Fountain of Wisdom), an introduction to the Cabala, drawn chiefly from the works of Isaac Luria. This latter work was first printed in Amsterdam, 1652, then in Koretz, 1684, and lastly under the title "Ṭob we-Yashar" (Good and Right) in Berlin, 1706. Moses ibn Zur put it in rimed prose under the title "Mebo Sha'ar ha-Shamayim" (The Way to the Gate of Heaven), but this was never published. Benjacob, Oẓar ha-Sefarim, pp. 55, 350.